As I walked out of my last exam of my last semester at SNU, there were many things I knew for sure I would never do, or have to do ever again in my life. I remember camping out at 24-hour cafes during exam week and learning which true friends stick it out with me until the first bus back to the dorms. I remember always having to cut short my summer or winter vacations in paradise because SNU - the university that has to be first in everything - starts course registrations a whole month before the semester actually begins. In this war to sign up for the choice classes before they fill up, where a few milliseconds can make all the difference, no weapon is more powerful than the blazing internet speeds of Korean PC bangs. And of course, reading the same chapter of James Joyce’s Ulysses over and over (and over) again, only to be quizzed on what colour Bloom was wearing, what the brand of his hat was when he went out to buy what type of meat at the porkbutcher’s, but instead had to get what because that something he had initially wanted was sold out -- because apparently all of these miniscule details were so immensely significant in understanding the masterpiece. Never in a million years would I ever want to do SNU again. Just the thought of it gave me neck jerks and shoulder shudders. Yet there I was on my graduation day, already starting to reminisce about my alma mater, and wishing that I could rewind a few years. I missed strolling to my next class under the blooming SNU cherry blossoms, the days I spent burrowing through the movie stacks of the Multimedia Plaza in Kwanjeong Library - my private little cinema - repeating the task of checking off and adding further to my movie bucket list, which never seemed to get any shorter. The daze of nostalgia lasted but a few seconds. As soon as I overheard my friends talk about the number of choanji’s they had to get signed, I was sure I had made the right decision to escape that life and never go back. I have now come to a place of compromise: while I am absolutely certain that I would never want to do SNU again, there are definitely areas of my college experience that I reflect back on and wish I would have done, or done differently, if I were to do SNU again (which, of course, I wouldn’t ever do). No matter how much we love our university, there comes a point when familiarity sets in. We take the same path to class, we study formulaically to get the highest grades - we come to know the system. I believe exchange programmes are a perfect escape for students experiencing this plateau. Yes, it is nerve-wracking. The process of learning to navigate new administrations and pedagogical styles, living alone in a new environment, making new friends. We wonder if all of this will be worth delaying graduation, which can happen because of the complications of transferring credits. But when I see my exchange friends booking the KTX to their next adventures in Korea, making lifelong friends from all over the world during their time here, and genuinely enjoying their experience, graduating a few months later seems to be the least of their problems. Of all the exchange students I befriended in Seoul, some have left, many are still here, but none have regretted their decision to seize the opportunity to study abroad. Though I love learning new languages, once I get into the complexities of grammatical rules and get quizzed on them, my passion for the language devolves into just studying for the purpose of passing exams. Knowing this about myself, I refrained from taking any more language courses than the required few during my four years at SNU. 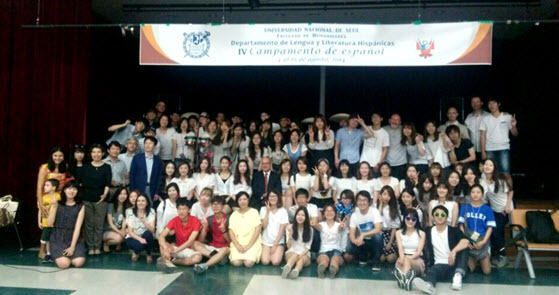 But traditional language classes are not the only way to learn languages at SNU. 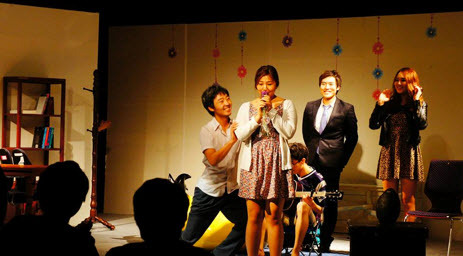 The SNU in World programme run by the Office of International Affairs (OIA), along with the language camps provided by certain departments in the College of Humanities allow students to learn the language not only through books, but through practical usage while immersed in the country. Korean society in particular, looks condescendingly at young adults who spend their vacations doing things other than building their resume. Most college students I know are guilt-tripped into doing just that - earning qualifications during their school holidays, despite the growing recognition that free exploration is valuable for youths. 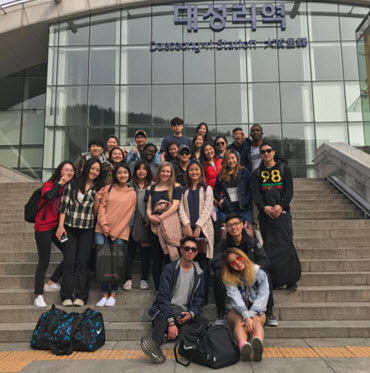 SNU’s language programme serves as resume material, but while providing a rich, travel experience that almost makes you forget that it is studying. My main goal throughout my four years at SNU was simply to graduate as fast as I could; learning was just a byproduct in the pursuit of that goal. I was caught up with taking only the minimum number of courses I needed to graduate, rather than taking the time to explore the various courses that might have made my studies more meaningful and valuable. For example, I learned too late about the courses at the Center for Teaching and Learning, which offer extremely valuable, lifelong skills -- for free! 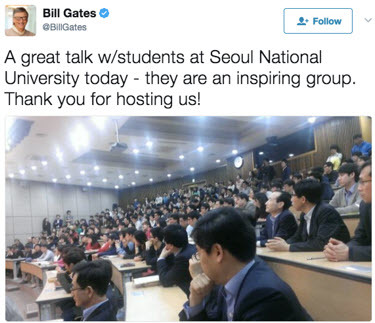 There are also plenty of seminars and workshops happening around SNU, sometimes given by famous people (Bill Gates - yes, that Bill Gates - was one of them). Being solely focused on graduating, I also had no passion for what I was learning in my major. It was only after I graduated that I picked up a literary classic purely out of my own desire: I read my first Jane Austen book only after graduating with my BA in English Language and Literature! And after years of reading literature for classes, only now did I finally learn how to appreciate it. Entrepreneur Anthony J. D'angelo once said, “Develop a passion for learning. 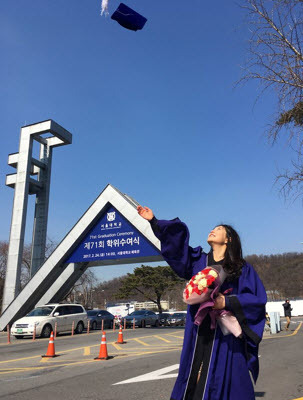 If you do, you will never cease to grow.” I wonder how much more I would have benefitted from my studies, how much more I would have grown, if I had this passion throughout my years studying at SNU. Throughout elementary, middle, and high school, I was always the student that attended school more for the extra-curricular activities than for the regular classes. Drama rehearsals, sports team trainings, senior delegate meetings, jazz band practices, charity event meetings - these are the fondest memories I have from school. When I came to college, however, I detached myself from all of that. Despite my friends urging me to join a sports team or the theatre and musical theatre clubs, I found all manner of excuses not to - the commitment was too great, I was not accustomed to the drinking culture deeply ingrained in these clubs, I was not good enough. But had I made efforts rather than just made excuses, I know I would have had more lifelong memories in SNU like the ones I cherish from my pre-college years. SNU has over 100 clubs and sports teams to offer. There is definitely something for everyone, except any room for excuses! If I miss the beautiful nature at SNU, a bus ride is all I need to be immersed in it once again. If I miss my friends, they are only a text message or a phone call away. But the professors -- meeting up with them again is not always so easy. One of the things I miss most about SNU are the professors that I got to know personally. It would often start off with a simple request for a one-on-one appointment - whether it was for an assignment I needed more help with, or for career advice - that soon developed into more informal talks, about the class or about life. I gained a greater appreciation for my professors once I was able to listen to their stories and know what they have been through to get to where they are today. Professors can help us greatly, even beyond the classroom - I got my first internship right out of college from a short coffee break I had with my professor! Ask them questions, learn from their mistakes, heed the advice they give - they are genuinely eager to help us reach our full potential. Besides, aren’t we also more willing to listen to the advice of anyone else other than our parents? Despite my complaints, and the ungrateful attitude I harboured throughout my years as an SNU student, I always knew at the bottom of my heart how much of an honour it was to be one. My glory days as an SNU student are over, but I hope those that are still there walk those grounds with their heads held high, feeling proud, fortunate, and honoured. I write this article from a place of acceptance and gratitude, with a wishful hope that through my honest regrets and experiences, current students may be able to experience a more enriching college life that they can proudly look back on. Today everything begins with you!